“How’d you two become friends?” “…we met on Twitter!” This origin story has sparked a few of my dearest friendships, since making an account in 2011. What about 140 280 characters fosters such strong connections? After letting the question distill for a year, a potential answer is starting to take shape. Twitter has the magical ability to cultivate ambient intimacy. Each day, folks in your graph get a slice of your thoughts, joys, and embarrassing moments1. The “ambient” nature of this dynamic is crucial. A simple “follow”—say of user X—translates into X’s online consciousness being threaded into yours. Moreover, this intimacy can span years, even before meeting X in-person. One of my great friends, Ryan, followed me for multiple years prior to cold emailing after my move to the city. Below, I attempt to break down the components that give rise to ambient intimacy and how it’s embedded in other services. Ambient intimacy appears to have a few attributes. Namely, effortlessness, a metaphorical surface area, cadence, and deliberate choices around nomenclature/context. Let’s step through each. To catch up with friends and loved ones, a common approach is to ask “how are things going?”-style questions. They’re well-intentioned gestures that are necessary on occasion. But, they have a sticking point: an asymmetric amount of “effort” involved between the asker and the recipient. Firing off a quick “how’s the week been?” message takes seconds. To answer it, one has to (lossily) translate a week’s worth of emotions, interactions, and thoughts into text, which takes a lot of emotional energy. While the asymmetry is resolved by reciprocating the question, the net effort for both parties is still high. Ambient intimacy navigates around this. The intent isn’t a replacement for genuine catch-ups, but rather a lightweight way to maintain the pulse of a relationship. Services attempt to “reduce“ this energy spend through specific cues. For instance, I’d often use Timehop entries as the starting point in a conversation that would otherwise be awkward to resurface out of the blue. Another example is Apple’s Activity watchOS and iOS apps. 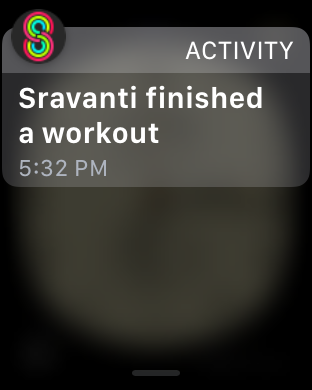 Throughout the day, Activity will send notifications as friends complete workouts and close their Move, Stand, and Exercise rings. 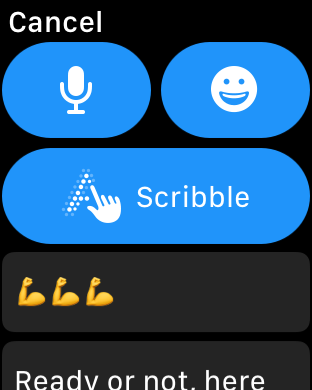 watchOS makes cheering on my friends easier by pre-populating replies. Further, there isn’t an extra, explicit step to trigger these notifications. They silently fan out to all shared contacts upon workout completion. Ambient intimacy isn’t a one-and-done checkbox; it takes a while to bake. I visualize this intimacy as a sort of surface area. By vulnerably sharing on mediums like Twitter, I’m able to increase this metaphorical surface area, which folks can use as a jumping off point in taking relationships online to offline. Tangentially, there’s something special about tweets having timestamps. They add a timescale to this surface area. Being able to look back on dated interactions adds depth to a relationship that “we’ve known one another for eight years!“ glosses over. @jasdev congrats on the move. are you in NYC now man? While ambient intimacy shouldn’t be strictly regimented, it tends to fall into a natural cadence. My Twitter following graph’s consciousness is in my pocket every day. That’s incredible to think about. As we’ll explore in a bit, different mediums cultivate intimacy at specific paces depending on the unit of consumption (e.g. tweets ⇒ daily, podcasts ⇒ weekly or monthly). The final components are network nomenclature and context. First, the nouns and verbs a service uses influence the weight of a relationship. Nuanced differences between “subscriber,“ “follower,” “friend,” or “connection” shape our interpretation of the edges between nodes2. This is part of the reason why losing a Facebook friend stings a bit more than losing a Twitter follower (aside from bidirectionality requirement). What units of the medium are “next to“ each other? For instance, sending a birthday wish over email can be a diamond in the rough for some, but accidentally induce an ounce of “work“ for those who strive for inbox zero. Similarly, sending birthday wishes over Twitter is a small, public leap of faith. But, it’s sometimes hard to avoid comparing them to tweets about our current administration’s blunders being a scroll away. Both nomenclature and context tie back into ambient intimacy. By carefully choosing the labels we use in our products and the context in which they’re used, we can alter the nature of connections that are formed3. Having someone’s voice in your head day over day, week over week, or month over month is powerful. On a long enough timescale, it almost feels like you know the host(s), even if you’ve never met them. Moreover, depending on the context in which you consume podcasts, the hosts may “anchor” themselves to parts of your routine—commuting, cleaning, cooking, etc. Personally, I noticed this with my friend Sam. Prior to meeting in-person, I listened to a show he co-hosted, Immutable, for months (and even submitted questions to be discussed on the podcast). This made meeting him at a conference feel like catching up with an old friend. I’ve worn my Apple Watch every day since April 2015 (minus a week-long retreat). While my praise for the device—when used to check one’s phone less frequently—could be a post in its entirety, the Activity app deserves a special mention. Apple may have accidentally created a network here that furthers its staying power. https://t.co/Dfc0udtvXE on Watch has a good chance to be another accidental social network that locks people into the Apple ecosystem. As mentioned in the “Effortlessness” section, Activity Sharing lets me passively broadcast my fitness milestones and workouts. On the receiving end, it feels—figuratively and literally—like a pulse that holds so much potential. I’m able to get a slice of my friends’ days, no matter the distance, delivered right to my wrist. RSS may be “dead“ for all mainstream purposes (aside from quietly powering the podcast industry), but I’m a holdout. The Web seems to oscillate between algorithmic and raw feeds (e.g., RSS) and we’re currently on the upswing of the former. However, what’s special about RSS is its postal system-like nature. Feed entries arrive at a digestible pace and the protocol prevents any typical notion of “engagement.“ No likes, RTs, or comments. Posts simply float out into the ether. Following my friends on both Twitter and RSS has been fascinating because of this. More specifically, when feed items aren’t cross-posted to normal social channels, it’s a small glimpse into their digital inner life. Ambient intimacy is an invisible foundation. Some of my favorite services, protocols, and cherished friendships are built upon it. I wholeheartedly believe there’s a spectrum here with gaps to be filled—which makes me wonder if next wave of social products will be those that foster this intimacy. Special thanks to Jason, Chris, and Shiva for feedback on early drafts of this essay.